Add water and jaggery together in a skillet. Let the jaggery melt and add the coconut. Saute the mixture on a low heat until thickens. You need to have some moisture left in the mixture. Other wise when it cools the filling becomes hard. Add the ghee and cardamom powder. Mix well and transfer it to a bowl. 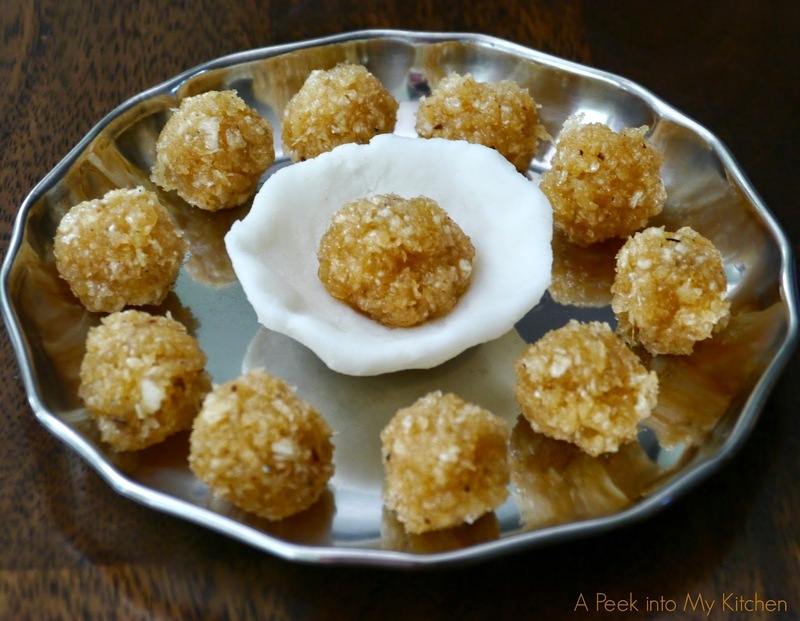 While its still warm, grease your palms with ghee and make a small marble sized balls. To make the dough, combine water, oil and salt in a skillet and let it come to a boil. Reduce the heat and add rice flour little at a time. Stir until all the water is absorbed, Turn off the heat and transfer the dough into a bowl. Cover the dough with wet paper towel or cloth. Let it stand for 2 minutes. While it is still hot, grease your hand with ghee or oil and knead the dough until smooth. If it is too hot to handle, you can use a potato masher and mash until smooth. Cover with wet towel. There are tow ways to make kozhukkatai. One is the traditional shaping method using your hand and the other method is by using the mold. 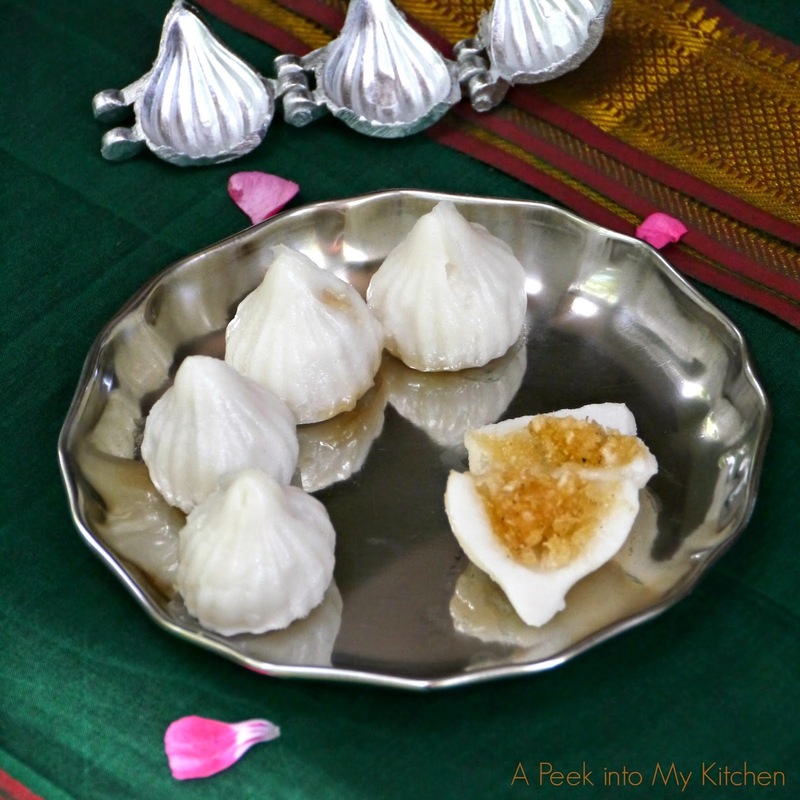 I used the mold to prepare my modakam. Hand method: Grease your palms with oil and take a small amount of dough and make a ball. Pinch the dough along the edges with both hands in a circle and make a small bowl shape. Place the jaggery filling in the center and close the dough to form a cone shape. Repeat with the rest of the dough and keep it aside. Mold method: Grease the inside of the mold and close it. Take a small amount of dough and press gently around the inside wall of the mold. Now put the filling in the middle and cover with some more dough. Gently press the mold and remove excess dough. 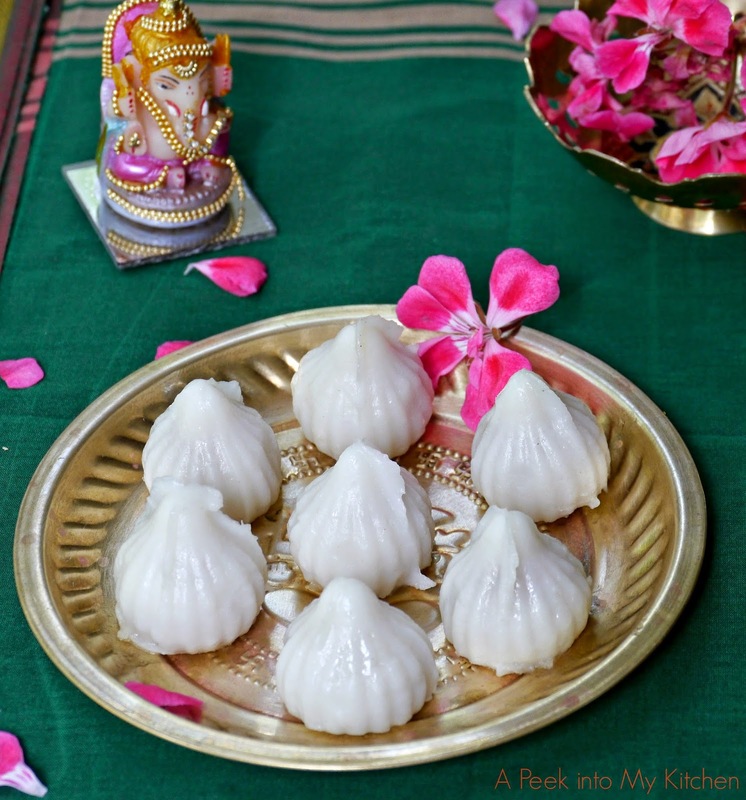 Open the mold and remove the shaped modakam. Repeat with the rest of the dough. Steam cook the modakams for 10 minutes. In a large mixing bowl, combine wheat flour, rava, gram flour, salt and all the spices along with 2 tsp oil. Mix thoroughly..
Add water little at a time to make a soft dough. Knead for 5 to 7 minutes until soft and pliable dough Cover and let it rest for 10 minutes. Heat oil in a deep pan/ skillet on medium high. Meanwhile, make small balls out of a golf sized dough. Roll each ball into circles of medium thickness. 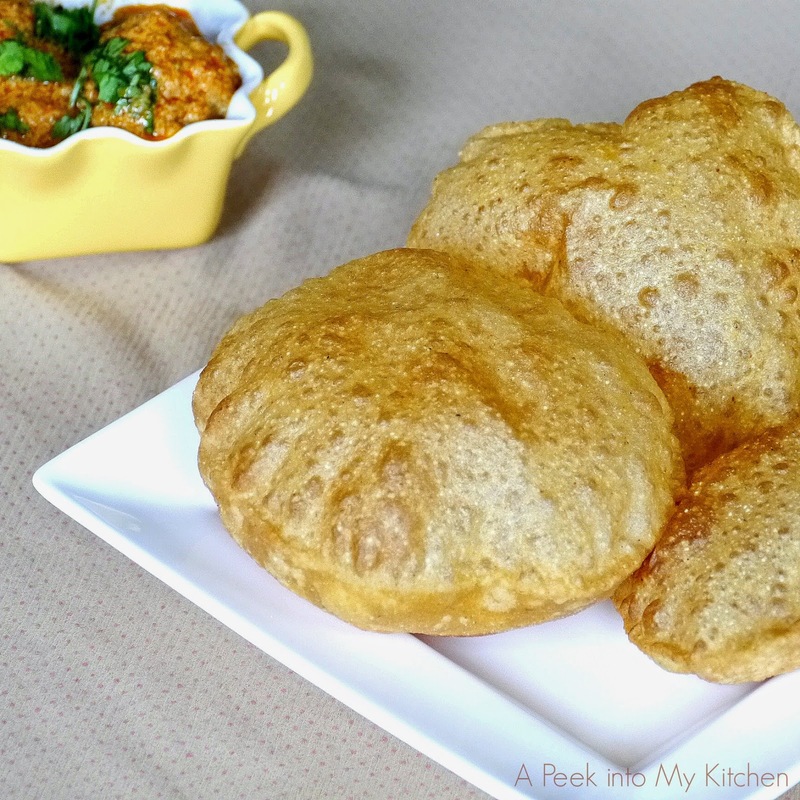 If it is too thin, poori will not puff up and it will become crispy. Slide the rolled poori in hot oil. As the poori cooks and slowly comes to surface, gently ladle some hot oil on top of the poori with a slotted spoon. This will help the poori to puff up. Flip the poori and cook the other side until golden brown. Remove and drain on paper towel. Repeat the process with rest of the dough. 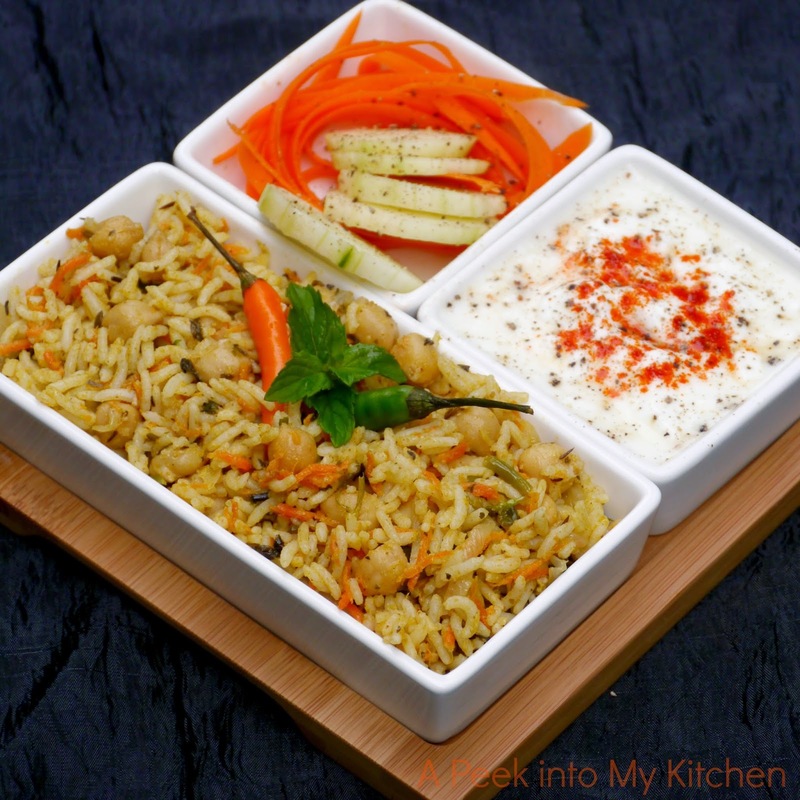 Serve hot with potato masala or dish of your choice. Rinse and soak the rice in 2 cups of water for 45 minutes to 1 hour. After soaking, cook the rice along with 2 cups of coconut milk in a pressure cooker until soft ( 3 to 4 whistles). Dry roast the ingredients listed in the garam masala powder for 45 seconds on low flame. Let it cool and grind into coarse powder. In a small mixing bowl, mix in the yogurt, ground masala powder, 1/2 tsp turmeric powder and red chili powder. Whisk well and keep it aside. Heat oil and ghee in large deep skillet. Add bay leaves, black cumin seeds. Fry for 20 seconds. Add the sliced onion, ginger, garlic and slit green chilies. Fry until the onions are soft and transparent. Add the shredded carrots, 1/2 tsp turmeric powder and saute for 2 minutes. Mix in the yogurt mixture, chana and salt. Cook for 5 minutes on low flame. Switch off the flame and add the chopped mint and coriander. Mix well. 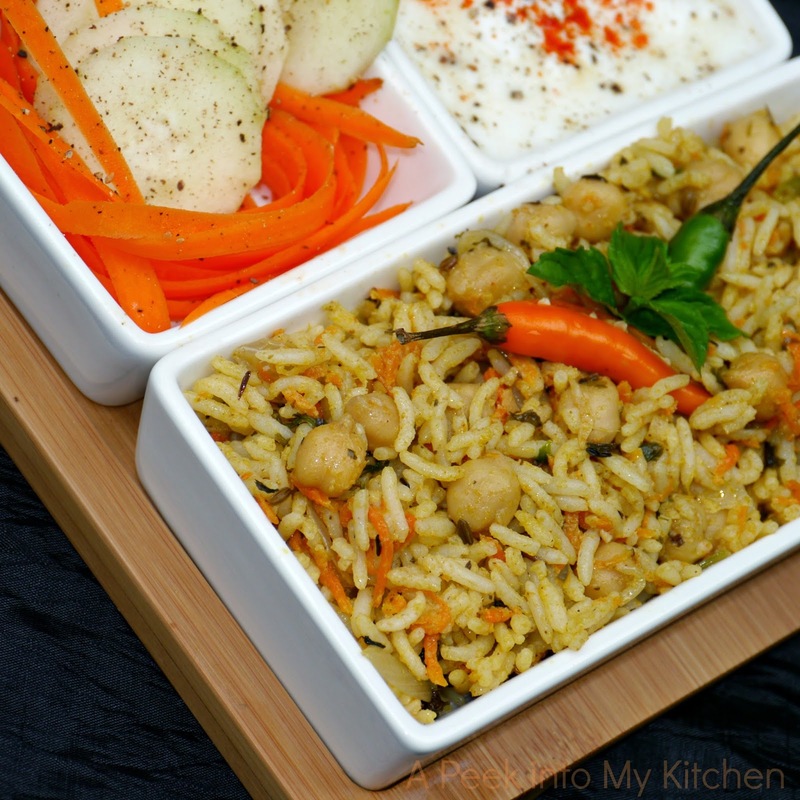 Spread the cooked rice on top of the chana and let it cool for 5 minutes. Gently mix the rice to coat with all the spices. Let the rice sit for 10 minutes to soak in all the flavors. Serve with your favorite raita.